Have you ever received a gift that has left you speechless. The following gift certainly left me that way. One quiet afternoon, an unassuming parcel arrived, quite by surprise. 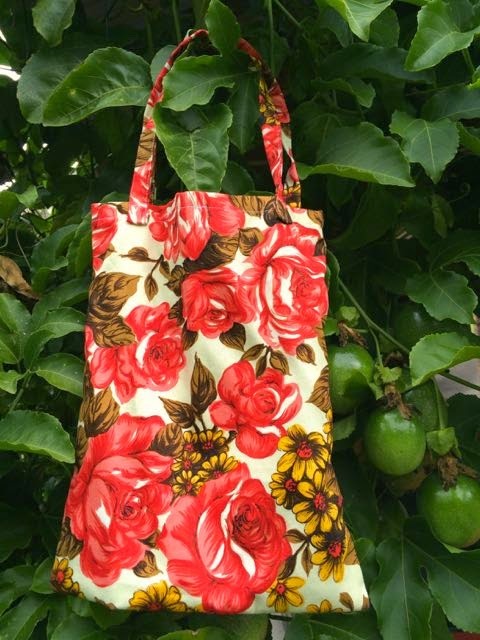 I opened it up and found this bag with the most wonderful vintage floral fabric. "Oooohhh lucky me!!" I thought as I realised who it was from. 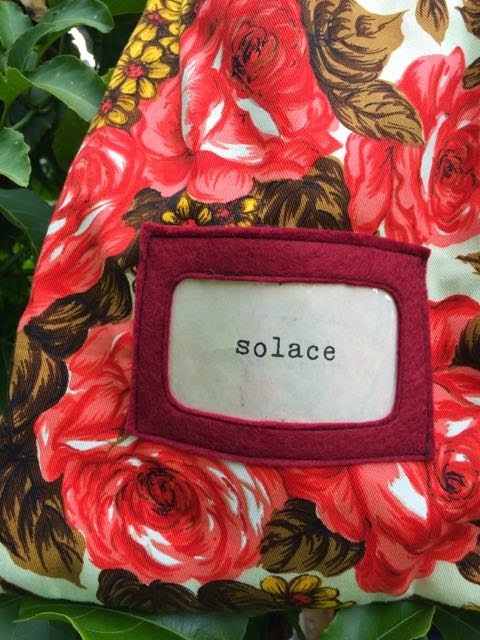 Rebecca from Needle and Spindle makes these Solace craft, project bags, just the right size to carry knitting or some hand sewing. and then it knitted on fine needles. What can you say about such a treasure?? and hope that these photos show a little bit how much I love this beautiful gift. The colour even matches the flowers in our front yard. 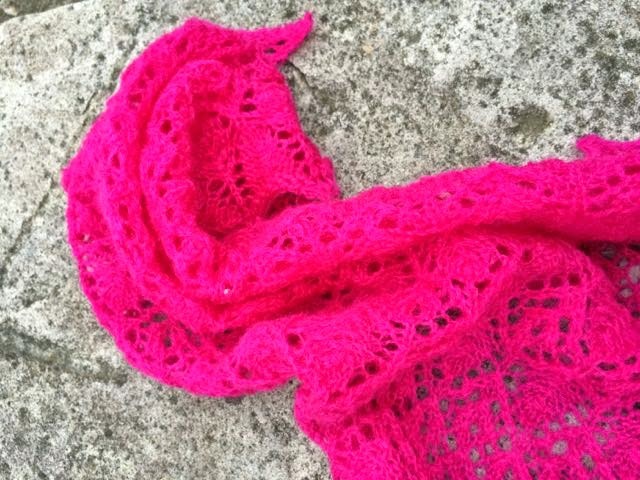 To read Rebecca's story of making the shawl pop over to this post at her blog Needle & Spindle. Her photos make it look as though its flying. 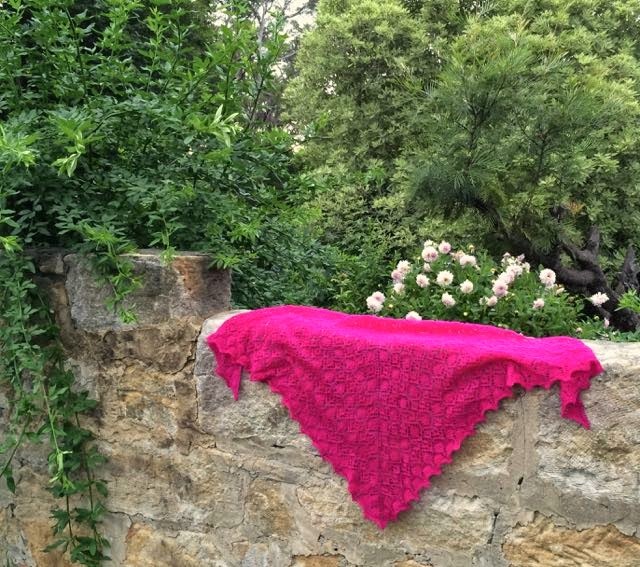 Don't be surprised if you get caught up reading other posts too, Rebecca always has such interesting and wonderful things to say about all things crafty, thrifty, sheep, other woolly beasts, gum trees and life in Australia. 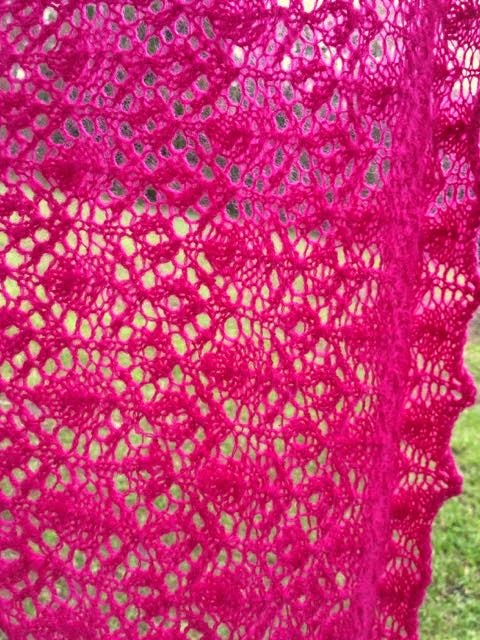 Ps, The colour in these photos is more electric than the yarn's colour is in real life. I tried to tone it down but to no avail. 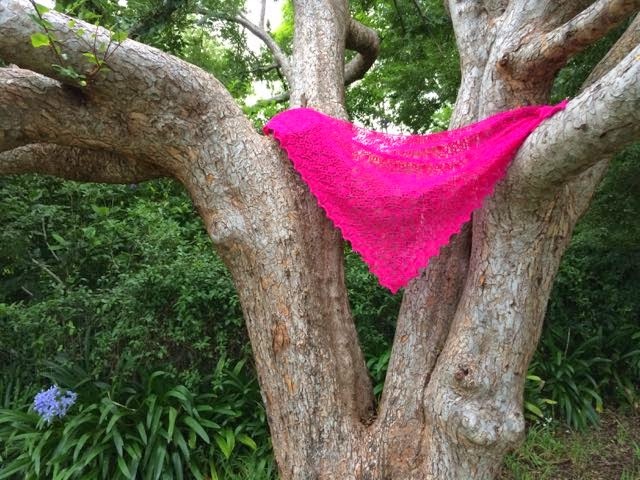 In the end I figured if the shawl wants to glow in photos then let it. It's the glow show that must go on! Rebecca è fantastica, ha creato un capolavoro! Rachaeal è molto fortunata, due regali stupendi! wow what beautiful gifts!!!! amazing talented! Halo Rachael, what a wonderful friend you have, to send you such a beautiful gift! Hi dear Rachael! The gifts from Rebecca are so wonderful! The color of this shawl and this bag are amazing! WOW indeed! 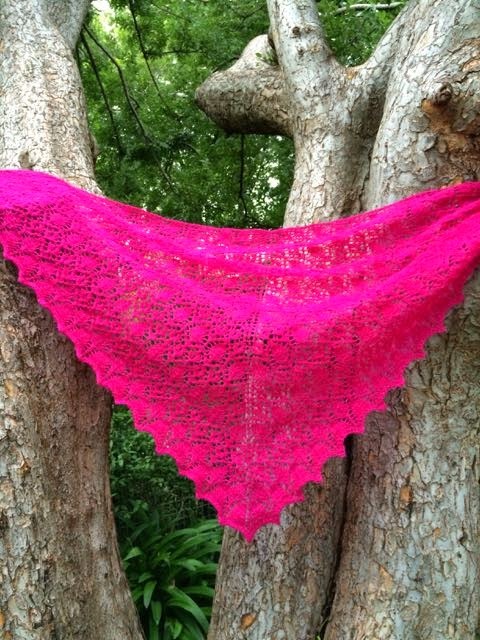 That shawl is absolutely beautiful! I love pink, but don't wear it often! I'd want to wear this everyday, no matter what the weather! You will be a star of the Blue Mountains! A heart felt gift from a wonderful spinner and knitter. The color is very you. I know you will treasure the shawl. Awww! You have me blushing the colour of the shawl! That shawl could only belong to you and I knew it right from the spinning. It looks perfectly at home at your place. I am glad it surprised and pleased you as much as your quilt did us. Wow - that is indeed an amazing gift! And you are the perfect recipient; you already treasure it. 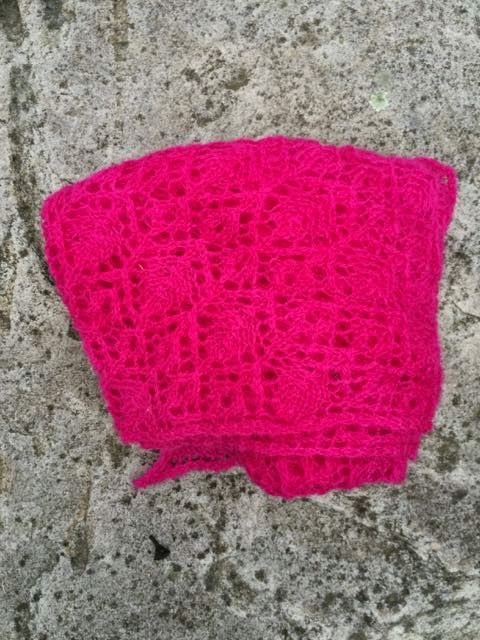 I love that Rebecca spun the wool herself (and as for knitting it, well, I am always in awe of knitters!). The bag is beautiful. 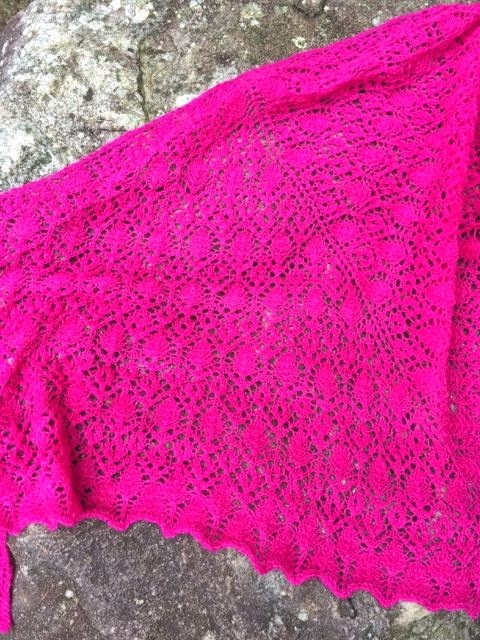 The shawl is staggeringly beautiful! With your pretty face & black hair wrapped in that fuschia, you will look like a flower! What a nice gift! 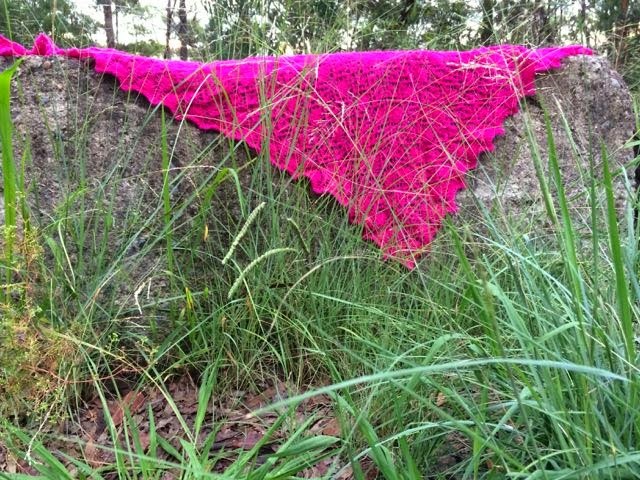 The shawl is beautiful but even more special knowing she spun the wool herself! Wonderful! Definitely a gift from Rebecca's heart and talented hands to yours. How lovely. Such a splendid gift! what a fantastic gift - and a pink like that is definitely made to glow! Gorgeous gifts! And what a lovely surprise. What a beautiful and thoughtful gift of fiber ! What fabulous colors. I'm about to pop over to Needles and Spindles to have a look around. 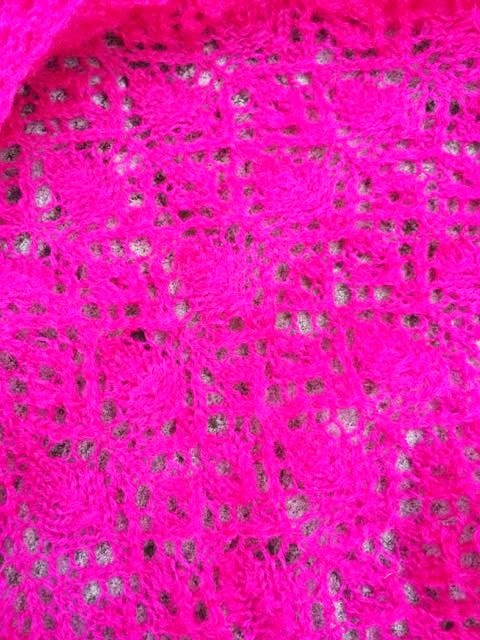 YOU are the PERFECT recipient for this amazing knitting and I know you will wear it with VERVE and FLARE !! yea! What a happy surprise to receive in the mail! 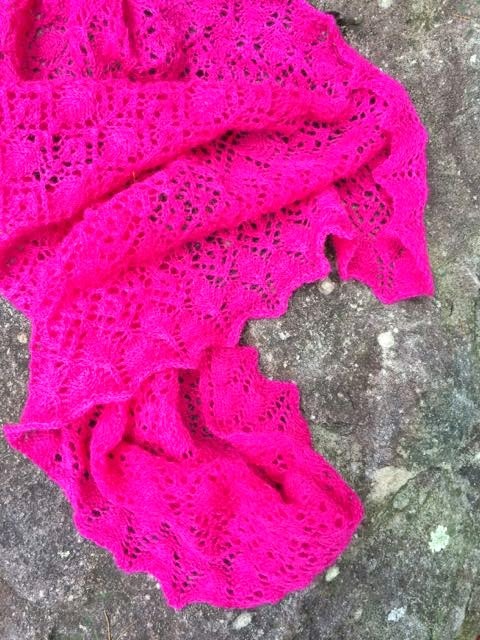 I will bet you will look gorgeous in that pink shawl! Dang am I impressed - that is gorgeous!!! That is truly a one of a kind gift! How lucky you are to have her as a friend. It will look gorgeous on you with your dark hair. I can't leave a comment on her blog since it's wordpress but I enjoyed the post. 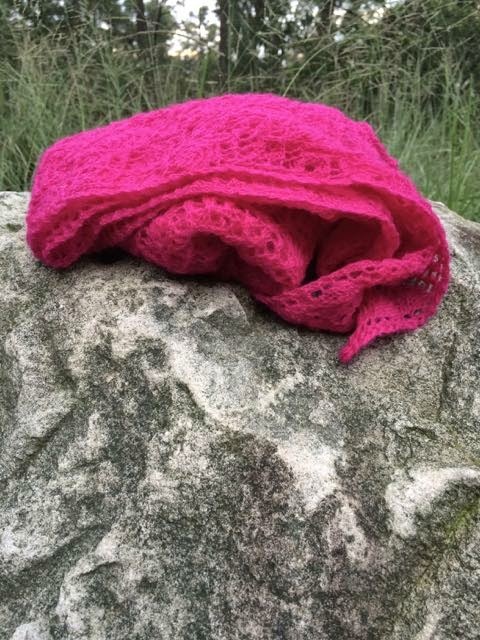 I love how the yarn revealed it's destiny to become a shawl for none other than you! what a fabulous surprise gift!! Isn't that just wonderful. It is an incredible color and I bet is looks perfect on you with your dark hair. Wee -what a fun package for you!! Wow is right! Both are beautiful. I know you'll wear and love them well. Stunning! 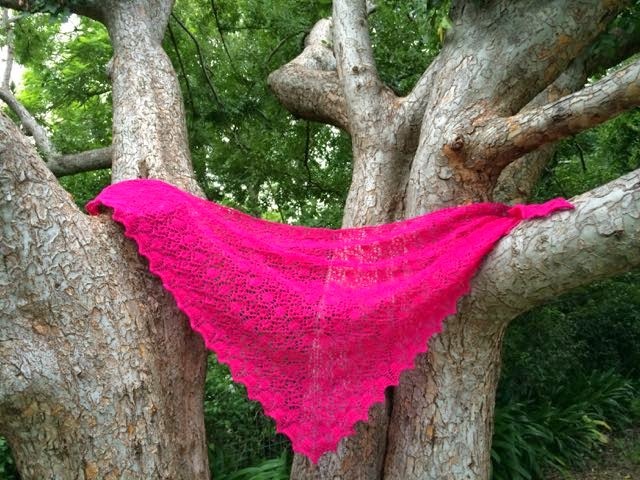 What a wonderful surprise, you will look even more gorgeous wearing that shawl. I love the tote too, beautiful blowsy flowers. Lucky you. Wow! 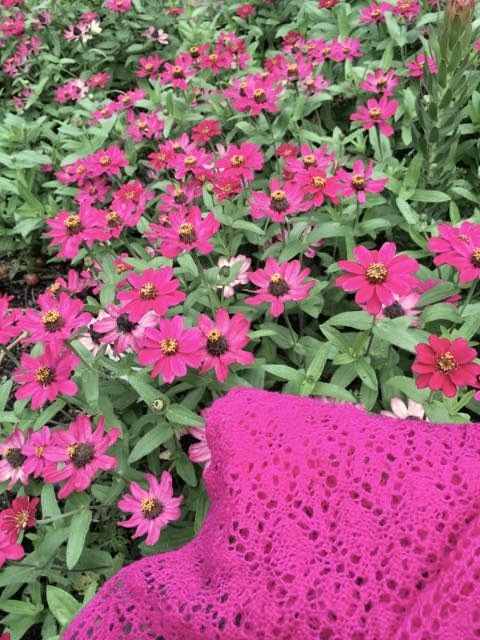 It's like you won the creative lottery ;-) To receive a handspun Merino shawl is an incredible gift and it's such a perfect color for you. There are such nice people in this world....Enjoy!! How beautiful is this!! This is a wonderful gift. I understand how much time goes into spinning even before the knitting starts. I am sure this will be treasured. 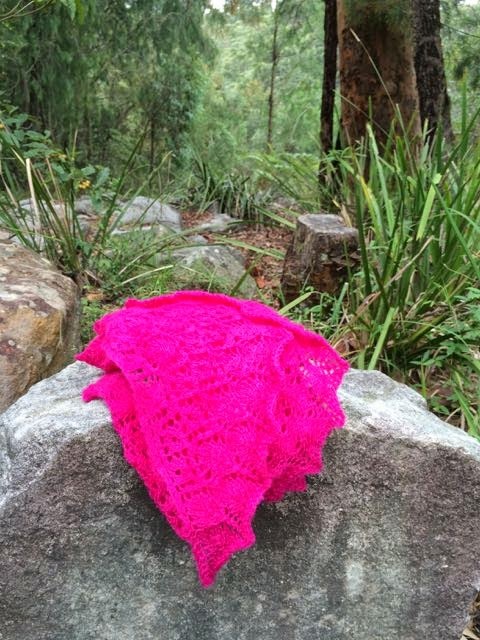 What a stunning shawl, obviously made with love. Surprise mail is the best!! Aren't surprises just the best and this one is really something very special. What a wonderful surprise. Beautiful. What a beautiful gift! Lovely knitting. Love your photography. Wow! Lovely gifts! Love both of them, and I know how much work they are too. OMG Rachael how gorgeous is that...just love it!